Our Charlie is growing up and looking beautiful. To date she has four Championship Certificates (CC’s) and only needs one more to be eligible for Champion status. Charlie is the daughter of Sally and Pilot (Ch. Craignair Desert Flyer of Stagmanskop). Milly is also due at the end of March. 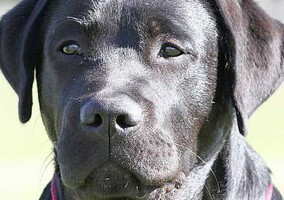 She was mated to Baldur (Grollemans Giving Happiness Corne) a Dutch import and son of Int. Ch. Carpenny Scenario. We look forward to a small but show-stopping litter! Sally (Foxrush Glint of Gold of Potiphar) is due to have a litter by Beau (Potiphar’s Solo Rio at Stagmanskop). She is due at the end of March but sadly it looks like a small litter. Beau (Potiphar Solo Rio at Stagmanskop) went Best in Group at the Liesbeek Championship show on 02.03.2015! We are very proud breeders! One of Milly’s star progeny, Beau (Potiphar Solo Rio at Stagmanskop) has done amazingly at this years Grahamanstown Shows. He won the Challenge Certificate (CC) on both days. Well done BEAU!! Milly had 5 pups on 2 September, 3 boys and two girls! 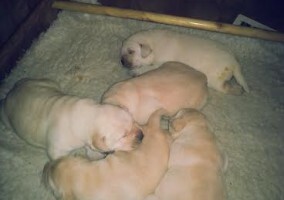 They have all been allocated and are growing very nicely. Watch this space for more pics to come soon! Milly’s pregnancy was confirmed by scan last week and there are at least five puppies. She will be due the first week of September. 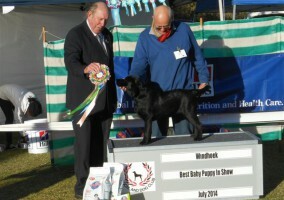 Charlie, our newest addition, just got Best Baby Puppy in show at the Windhoek show on 26 July 2014. We are all very chuffed! Beau has has been awarded his qualifying Championship Certificate (CC) at 18 months and one week at the Windhoek and Hochland shows at the end of July. He now qualifies for Championship status!